My family came out to visit us in New England last week. 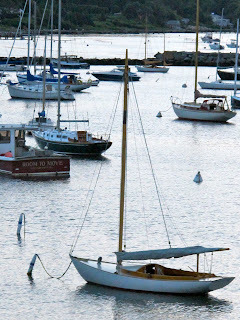 We decided that a trip to Martha's Vineyard would be a great place for them (and us!) to spend the vacation. Mike and I have driven out to Cape Cod, but had yet to visit Martha's Vineyard (or Nantucket... still on the list!). The weather was a little gloomy, but the island was so so charming we hardly noticed... ok, we noticed, but we were at least pleasantly distracted by the cute little towns, beautiful picket fence lined streets, shake-clad houses, fresh seafood (at every meal), and the star of the show, the sweet, crazy and adorable little lady, Samantha. To the Steffens & Heneghan Family : Thanks for coming to visit - it was so nice to see familiar faces. Maybe next time you visit we'll get five feet of snow!! The path to the beach - I loved that Martha's Vineyard was so rural and rustic. The first morning on the island, we headed to the beach - not ideal conditions, but the misty rain made for some great subtle muted colors. Mike dancin' in the rain... not really! I may have this shot framed - It is all of my favorite colors : Blues, grays, cream, neutrals. I think the colors are very "New England-esque." Sand in my toes - I don't think I'll ever stop loving that! These white jeans were my saving grace for the week - the only pants I brought along! Of course, the j.crew papaya pashmina always makes the trip. The resort we stayed at was perfect - classic Martha's Vineyard shake shingle sprawling resort in Edgartown. This was the view we woke up to in the morning - the fog made everything very calm. Alpacas are the unofficial mascot of the island. We all agreed that they are very curious looking animals! Raising sheep has been a tradition on the island since it was settled in the 1600's. All of the streets in Edgartown were so charming - brick walks, white picket fences, and large trees. Every single house was either white painted or natural shake shingles. I couldn't get enough of them! This shake shingle house was tucked in on a little side street. I love the simplicity of the structure and the brick drive. Jill : "Sam, what does a dog do?" Sam cracking up again... wish I would have recorded her giggle. For our last night, we went exploring to the fishing village of Menemsha. It was less polished than Edgartown where we were staying - this felt like a real fishing village untouched by time. The Menemsha area is known for the Home Port restaurant. A simple, BYOB, fresh lobster shack. Thanks again to our family for coming to visit - we love you! Your photos are FANTASTIC...once again proving that cloudy days are best for photography, nothing washed out, colors crisp. I have a draft for a post on MV, may I add some of your charming images? Of course, will credit your beautiful blog. I pinned several to my Pinterest account so you may see them floating around that site! Oh..I am also an Ina biscuit maker and have never had a dish made from one of her cookbooks that was not absolutely delicious! Me and my family always have a wonderful time when we visit the Martha's Vineyard rental Always fun to see others enjoying the same experiences!